Yom Kippur is the most solemn day of the Jewish year and is centered on atonement and repentance just before our fates are sealed for the upcoming year. Yom Kippur began at sundown, on Friday, October 7th and will end tonight with the rise of the first three stars. Among the customs on this holiest of days are fasting and the prohibition of bathing, wearing perfumes or lotions, or engaging in marital relations. Prayers are conducted in synagogues throughout the day. Israel comes to a complete stop on Yom Kippur. There's no traffic, no TV broadcasts, all restaurants and shops are closed. There's a serene quiet in the air. And in the secular neighborhoods that is just the time for two-wheelers. While some fathers feel it is their responsibility to teach their children faith, prayer and abstention, others take advantage of the empty roads to teach balance and agility. It's almost like a national bicycle day as kids hit the empty streets with their bikes, scooters and roller-blades. 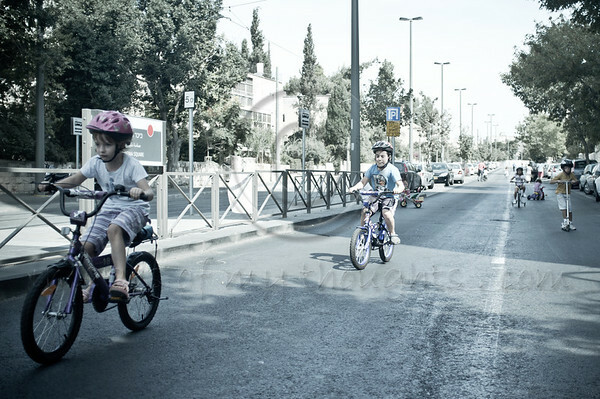 Yom Kippur is celebrated as a national bicycle day on the empty roads of secular neighborhoods as kids hit the empty streets with their bikes, scooters and roller-blades. Jerusalem, Israel. 08/10/2011.